People are generally familiar and comfortable with a doctrine of salvation that says that we will receive the wages that are due to us. If we do good works, somebody will reward us for what we have done. It does not make sense that somebody would grant something to us as a free gift, an unmerited favor. Men want to work for things, they want to take credit for what they have done. Therefore, men want to have a role in their salvation. They want to be co-redeemers with God. They want to be God’s partner in salvation. With this model in mind, reading the letters of Paul will make people very uncomfortable. 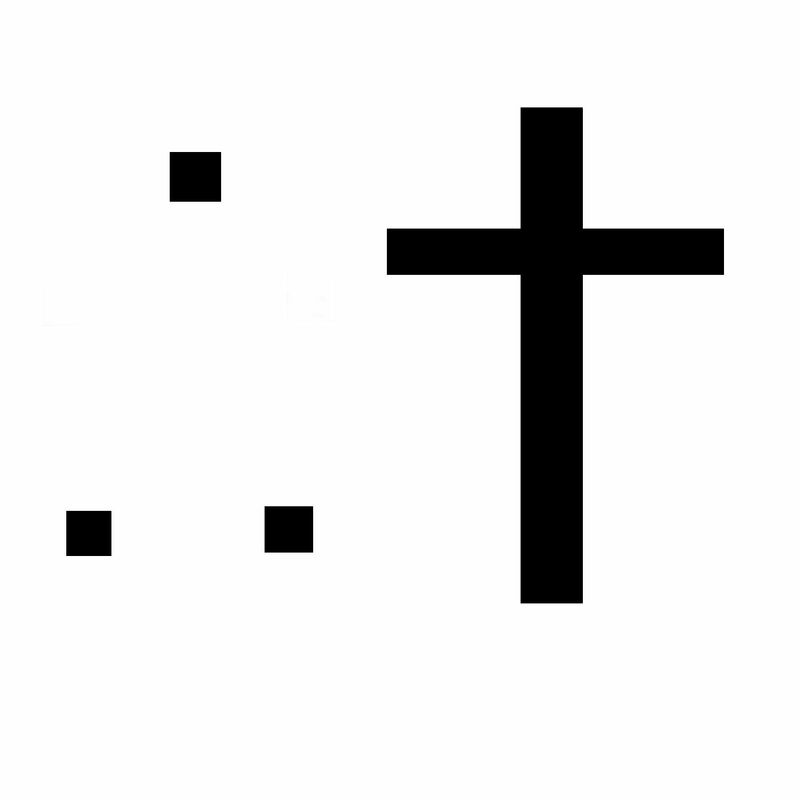 For Paul writes in Galatians 2:16, “…a person is not justified by the works of the law, but by faith in Jesus Christ. So we, too, have put our faith in Christ Jesus that we may be justified by faith in Christ and not by the works of the law, because by the works of the law no one will be justified.” In response, some people think we are justified by works, just not works of the Law. This means that Paul is excluding the works that are outlined in the Old Testament as capable of saving. But other works, such as the fruit of the Spirit (Galatians 5:22-23) can save. Are they right? Are we justified by works? Most good works are in the Law. If we are justified by works, but not works of the Law, that would assume that there are some works that one can perform which are not found in the Law. It is these works that justify. But if you are performing works that are in the Law, and you think that they justify you, then you are guilty of precisely what Paul argued against when he said that we are not justified by works of the Law. The question is, what sort of works are we justified by? Are we justified when we love our neighbor as ourself? Leviticus 19:8 (the Law) reads, “You shall love your neighbor as yourself.” Are we justified when we “love the Lord your God with all your heart, with all your soul and with all of your mind”? That commandment is in the Law as well (Deuteronomy 6:5). This means that if you are trying to be justified by works, you would have to do that without being justified by loving God or loving your neighbor as yourself. How would one do that? 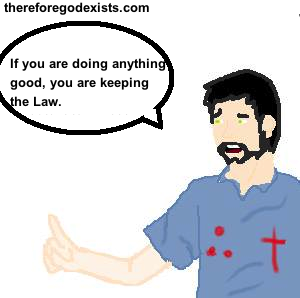 Some people think we are justified by works, just not works of the Law, and this overlooks the fact that the good works that one would seek to be justified by are in the Law. Is Paul only referring to the ceremony of circumcision? Some people think that we are justified by works, just not works of the Law, those works specifically being the ceremony of circumcision. Paul is arguing that we are not justified by our circumcision. A Christian can be saved without undergoing the process of circumcision. 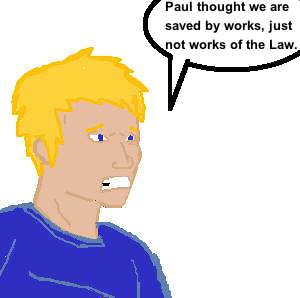 However, Paul often refers to the moral aspects of the Law while saying that we are not justified by the Law. In Romans 3:20, he writes, “…by the works of the Law no flesh will be justified in His sight; for through the Law comes the knowledge of sin.” If through the Law comes the knowledge of sin, then he is clearly referring to the moral precepts of the Law. He expands this point in Romans 7:7-12, where he uses the law against covetous as his example. Further, he often makes distinctions between the Law and circumcision. In 1 Corinthians 7:19, “Circumcision is nothing, and uncircumcision is nothing, but what matters is the keeping of the commandments of God.” In Romans 2:25, “Circumcision has value if you observe the law, but if you break the law, you have become as though you had not been circumcised.” Thus you will know that Paul is referring to circumcision when he mentions circumcision. But when he says that no flesh will be justified by works of the Law, he is referring to the moral aspects of the Law. Is there a “higher order” morality? If we are justified by works, but not works of the Law, that would entail that there was a higher standard of morality that transcends the standard given by God. There are moral precepts that are of more value than that which is found in the Law. The question is where we can find them. They cannot be to love God or to love our neighbor, because these are laws. It seems that the only answer that is forthcoming is that it is written on our conscience. So we have are called to follow a standard of morality that is different for everybody, that can be changed based on culture and comported to circumstances as opposed to God’s perfect standard of morality. What good reasons are there to think that God would replace his law with our conscience? Why would that even be necessary, when Paul wrote in Romans 7:12, “So then, the Law is holy, and the commandment is holy and righteous and good.” Some people think we are justified by works, just not works of the Law. But if the Law is holy and the commandment is holy, righteous, and good, then why should we think that there is a higher order system of morality that justifies us? Why would we not be justified by the Law if the Law is holy, righteous, and good? God justifies the ungodly. When people say that we are justified by works, just not the works of the Law, they are forgetting the positive argument that Paul makes. Paul says more than what we are not justified by. He has more to say about justification than “we are not justified by the works of the Law.” He tells us how we are justified. He writes that God justifies the ungodly (Romans 4:5). If God justifies the ungodly, then in what sense could a person be justified by their works? Further, Paul writes in Ephesians 2:5 that God “even when we were dead in our transgressions, made us alive together with Christ (by grace you have been saved)…” God justifies the ungodly and makes those who are dead in their trespasses into new creatures. Accordingly, God makes us new creatures when we are dead in our sins, when we are ungodly. When we come to him with an empty hand of faith, then he makes us new creatures and we become godly and righteous. But upon justification, all of our outward actions are only ungodly, and God still justifies us. Yet some people think we are justified by works, just not works of the Law. If that were true, this would mean that God justifies the righteous who are not dead in their transgressions. “For by grace you have been saved through faith; and that not of yourselves, it is the gift of God; not as a result of works, so that no one may boast.” Ephesians 2:8-9 Aside from Paul’s masterful treatise in the book of Romans and his impassioned rebuke in the book of Galatians, the second chapter of Ephesians is where the gospel is clearly presented. Paul explicitly denies that we are saved by grace through faith, and not of works. Of course, some people think that we are saved by works, just not works of the Law. The problem is that Paul negates any works by saying that this salvation is “not of yourselves.” If salvation is not of yourselves, all works are eliminated. Salvation is solely a gift of God. What Is Reformed Molinism? «» Is Justification By Faith Or By Faith Alone? Is Justification By Faith Or By Faith Alone? What Does ‘Jesus Died For Our Sins’ Mean?